Popovers are light, hollow rolls made from an egg batter. 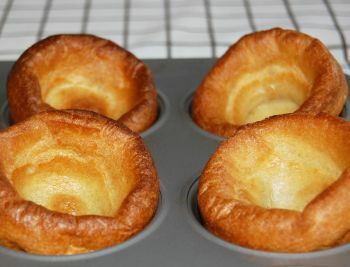 The name "popover" originates from the fact that the batter pops over the top of the muffin tin while baking. 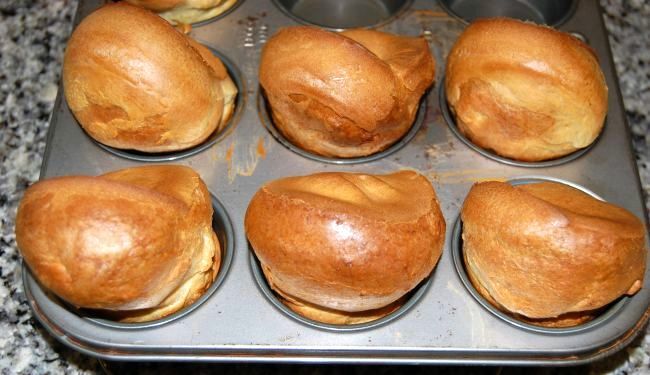 Popovers originated in America, but they were derived from recipes for Yorkshire pudding and other batter puddings made in England since the 17th century. Popovers are generally served at breakfast or with meats at lunch and dinner. Although the recipe for popovers is similar to the recipe for cream puffs, cream puffs use about twice the number of eggs and double the amount of butter. The eggs must be at room temperature, and the milk must be slightly warmed so that it is just warm to the touch. Put all the ingredients in a blender and blend for 10 to 15 seconds until smooth. Pour the mixture into a greased cupcake pan, filling each cup until 2/3 full. Place in oven preheated to 450 degrees F (230 degrees C) for 20 minutes. Reduce heat to 350 degrees F (175 degrees C) and bake for an additional 20 minutes or until a toothpick stuck in the center comes out clean. 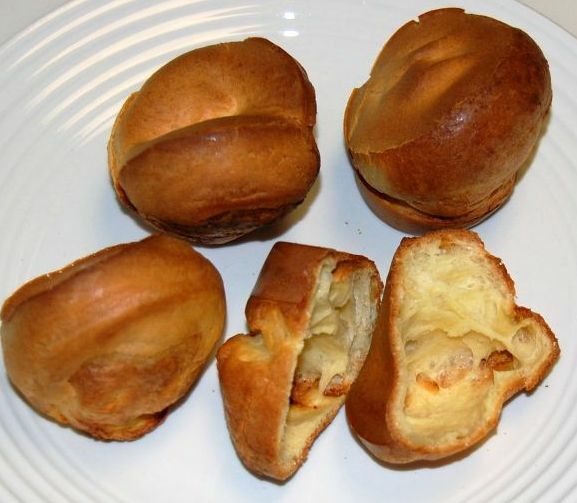 Popovers become hollow when steam pockets are created in the batter while it is still viscous. The popovers can retain their shape only after the heat coagulates the proteins in the dough and enough water evaporates. If the eggs and the milk are not warm or at room temperature, a long time will be required to heat the batter to a high enough temperature to form steam. If the water evaporates before steam starts to form, the puffs will not rise. This also can happen if the oven is not hot enough when the cupcake tray is placed in the oven. Similarly, if you open the oven door while the dough has not set, the popovers will collapse when the steam inside the rolls cools and condenses. The picture on the right shows popovers that were improperly baked. When baking begins, popovers will have depressed centers as the dough in contact with the metal heats up faster than the dough in the center. The dough on the top also needs to form a crust to retain the steam that forms. This can only happen if the oven is hot enough to start forming the top crust as soon as the batter is placed in the oven. The final baking at a lower temperature simply serves to evaporate the excess moisture and avoid a gooey center in the roll.